Bank of America: "The Last Time We Saw This In The Market Was 2007"
Yesterday, we presented readers with a troubling note from Morgan Stanley which attempted to answer arguably the only question that matters for the future of risk assets: "is the late stage credit cycle about to crack?" And with just under $1 trillion in anticipated stock buybacks in 2018 - which would be almost entirely funded through new debt issuance - whether or not credit remains a viable, and cheap, funding pathway has become the single most important question in the financial world. For those who missed the note, Morgan Stanley - which has been turning increasingly pessimistic in recent months largely as a result of the ongoing tightening in global liquidity and central bank financial conditions - warned that the credit cycle is on its last legs, noting that "in our view, a key driver is simply that global liquidity conditions are tightening, and markets are coming to the realisation that the process will be rocky. Rising funding stresses, weaker flows, weaker trading liquidity, higher volatility – this is arguably what quantitative tightening feels like and, in our view, these dynamics will continue to pressure credit spreads over the course of the year." We continue to see evidence that argues in favour of a very late-cycle environment. When we think about a turn in the credit cycles, we tend to break it up into two phases. First, in a bull market, leverage rises, credit quality deteriorates and ‘excesses’ build. These factors provide the ‘ingredients’ for a default/downgrade cycle. But they don’t tell you much about the precise timing of a turn. Leverage can remain high for years before it becomes a problem. In the second phase, these excesses come to a head, often triggered by tighter Fed policy, tightening credit conditions and weakening economic growth. 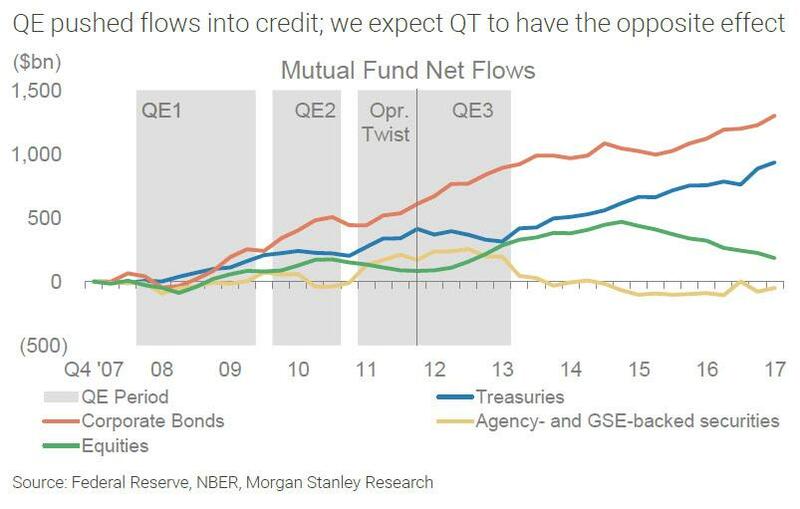 Morgan Stanley concluded that "evidence is mounting that spreads have hit cycle tights – in other words, that bigger fundamental challenges in credit are 6-12 months away, not 2-3 years down the road." 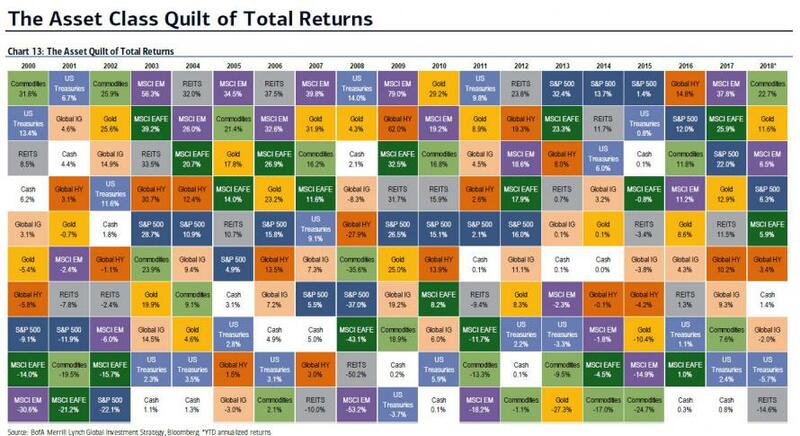 Late-cycle returns: asset returns YTD (annualized): commodities 23%, equities 5%, bonds 4%, cash 1%, US dollar -9%...“late-cycle” price action...last time asset performance ranked this way was 2007. 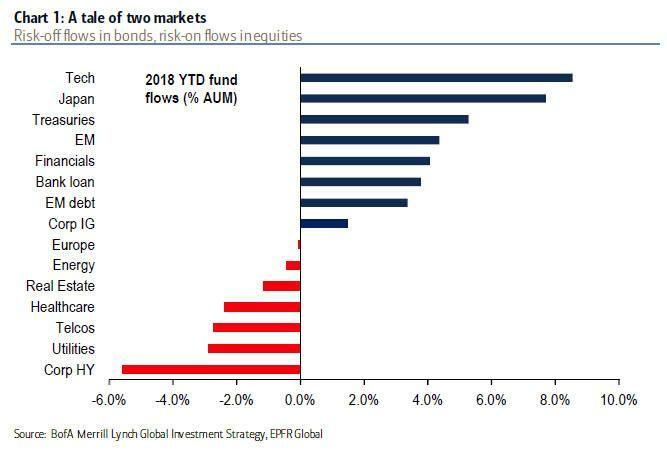 Since a late cycle economy (and market) always leads to a recession (the only question is when), it is therefore hardly a surprise that traders are extremely confused and acting - in BofA's words - as "schizophrenics": according to the bank, YTD fund flows are risk-off in bonds (inflows to govt bonds, outflows from High Yield), and risk-on in equities (into Japan, EM, financials, out of utilities, telcos). One of the two will be painfully, dramatically wrong. 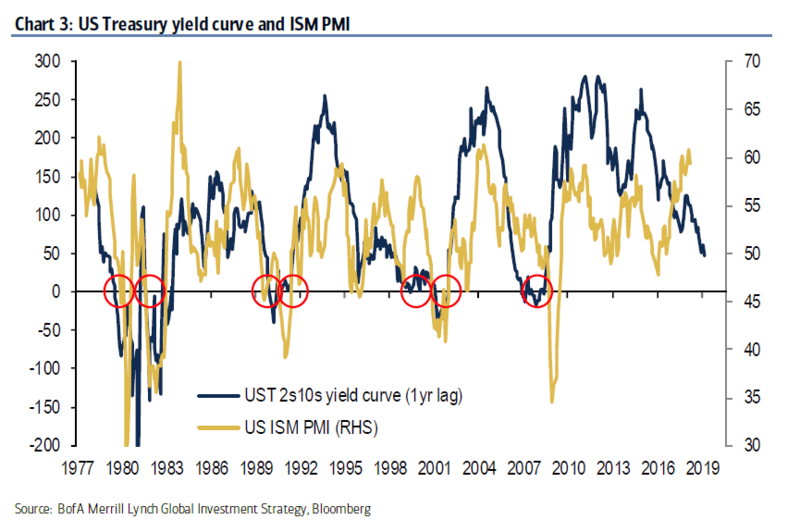 Meanwhile, as Morgan Stanley showed yesterday, increasingly more signs point to a recession, starting with the "recessionary yield curve" which bofa describes as follows: "flattest US yield curve (48bps 2s10s) since global synchronized recovery, despite record EPS, US tax cuts, record low unemployment US/UK/Japan/Germany, Fed selling, surging commodity prices"
This is notable because an inverted US yield curve has preceded ISM index dropping below 50 (i.e. economic contraction) 7 out of 7 times since 1977 with 12-month lag. Finally, the most glaring confirmation of the slowdown comes not from the US or Europe, but China, where Beijing just cut RRR for the 1st time since Feb’16, i.e. the time of the "famous" Shanghai Accord which sent global stocks soaring for 2 straight years. 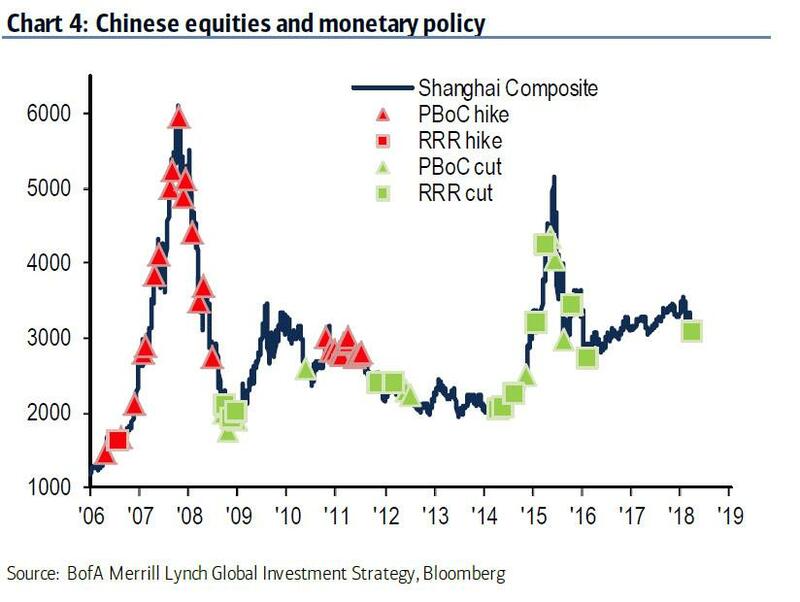 According to BofA, the strong CNY and slowing China/regional export growth trigger for easing, note 10yr Chinese yields have rallied 50bps in the past 6 months; as macro data reflect global slowdown and central banks blink; expect the rotation to defensives to accelerate. 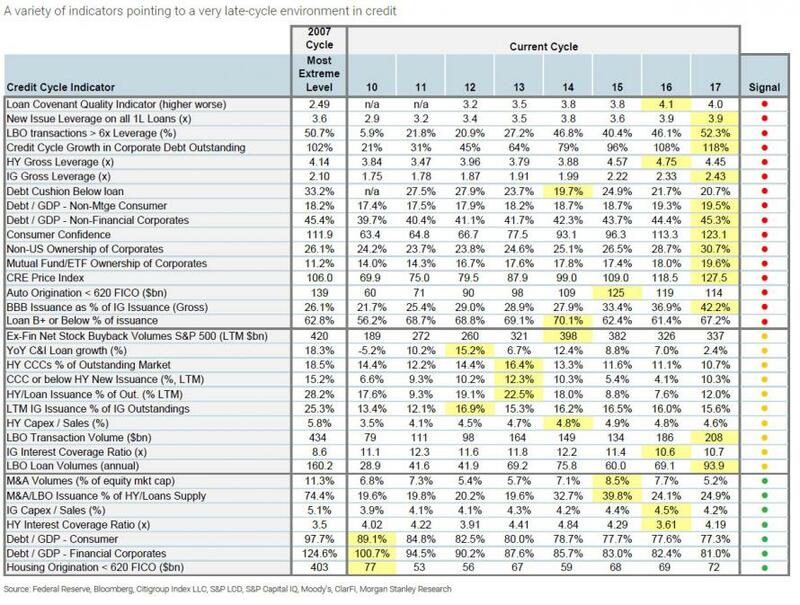 Finally, here again is Morgan Stanley's checklist of "late credit cycle" indicators, confirming we are "almost there."